A knit baby bonnet pattern in worsted weight yarn! A quick intermediate level project or for a seasoned beginner wanting to practice some stranded colorwork. These make perfect gifts for baby showers or your own little ones! There can never be too many bonnets for any baby, am I right? This worsted weight baby bonnet starts out with some rows of ribbing, and then a two color stranded pattern, worked in stockinette stitch. The edges eventually are joined together to finish up the bonnet knitting in the round. I use a crochet hook to add the ties and finish up the bottom edge. You can use either double pointed needles throughout the whole project or circular needles, or switch out between them both as you desire. I always think the funnest part of using multiple yarns in a project is picking out the colors! I recommend using Magnolia and Oak Fibers worsted weight hand dyed alpaca yarn for this fun project. For more knitting inspiration, visit my “How to Knit” Pinterest Board! One of the exciting things about the weather getting cooler is that it's time to put on those bonnets! These sweet crocheted baby bonnets have a feminine touch and are oh so cozy! Hand made from an Alpaca blend yarn makes them extremely soft. Available in three of my most favorite fall colors, mustard yellow, dusty rose, and forest green. Edged with a creamy white. As usual I can't decide which color I like best of all, how about you? P.S I think we're finally over our heatwave here, cooler temps are on the horizon. Are you stocked up on bonnets for your babe? Alysia and I have been so encouraged by the great response to our Heirloom Crochet Bonnet Kit, available at Magnolia and Oak Fibers on Etsy. We're so thankful to everyone cheering us on with this new project! And a few of you have asked if you could buy just the pattern. Well, now you CAN! The pattern for this sweet crochet bonnet is now available in my shop! The baby bonnet pattern is designed for beginners ready to take their crochet skills to the next level, and an equally fun and rewarding project for a crocheter with more advanced skills. You'll find the perfect mini-skeins of hand-dyed fine alpaca yarn at Magnolia and Oak Fibers in the prettiest pastels, they're the perfect amount of yarn to make one of these bonnets. This bonnet works up pretty quickly, using a magic circle, single crochet, double crochet and a front/back post double crochet stitch that is fully explained in the pattern. 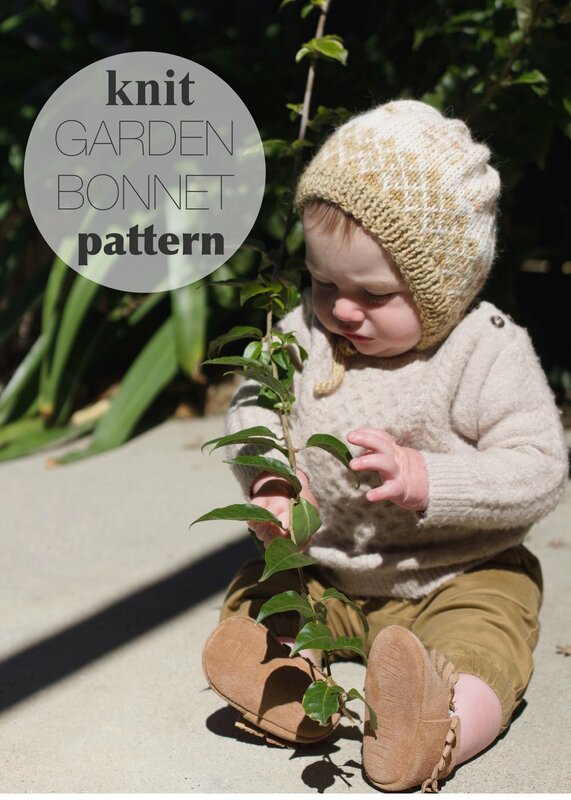 The pattern gives you a list of materials needed, step by step instructions to make a bonnet for sizes newborn to 24 months and photos to help show the process. Grab your Heirloom Bonnet Crochet Pattern Here! Brush up on your crochet skills with my Crochet Lessons Series. And practice your skills with this Free Crochet Dishcloth Pattern! Fall outfits can be so complicated! You want to be all cozy in a sweater and boots, but the sun is shinning too bright, so you wear that t-shirt, but then later in the afternoon you wonder why you're so chilly! Where's that sweater? Where's that bonnet? Little Addie here has is all figured out, onesie and bloomers on the bottom, cozy knit bonnet on the top, the perfect compromise! Outfit details: Bonnet from Blue Corduroy // Bloomers from Rhinestones and Tutus // Onesie from Mini and Meep // Rattle from Banner Toys // Lovey from Moon Child Co. I am so excited about this project Alysia of Magnolia and Oak Fibers and I have been working on over the past few months. A crochet baby bonnet kit where you can make your very own heirloom worthy baby bonnet! The timeless design of this bonnet paired with the luxury of this yarn makes it something that you would truly want to put on your little one. This crochet bonnet kit includes everything you'll need to make this simple and sweet bonnet in sizes newborn to 24 mos. Your choice of four colors of Alysia's hand dyed baby alpaca yarn, a birchwood crochet hook, a pattern designed by myself with beginning crocheters in mind and links to handy crochet tutorials, and a muslin drawstring project bag. The kit is available in four different color options. The softest baby alpaca yarn hand dyed with natural dyes by Magnolia and Oak Fibers. You can pick from Camellia, Manzanita, Larkspur, and Goldenrod. The pattern uses simple crochet stitches like a chain stitch, single crochet, double crochet and the magic circle. A front and back post double crochet stitch is used for the ribbing effect at the brim of the bonnet, which is fully explained in the pattern. Emily of Blue Corduroy and Alysia of Magnolia and Oak Fibers, in our happy place, hand crafting at the beach! These crochet baby bonnet kits are available now in Magnolia and Oak Fibers etsy shop. Let us know if you grab one, we'd love to see your finished project! You can find Alysia on Instagram @magnolia.and.oak and Emily @emily_bluecorduroy, come follow us and see what new projects we're working on! ...the hard part is choosing which color! Which bonnet would you choose for your baby?